A rodeo cow named Betsy has evaded capture for six months as she wanders the trails of Alaska's biggest city, the cow's owner said. The 3-year-old cow "busted out" of a pen before participating in junior events at the Father's Day Rodeo in Anchorage, rodeo promoter Frank Koloski told the Anchorage Daily News. Betsy headed to the Hilltop Ski Area and was spotted grazing on slopes during the summer, Koloski said. She then moved to the network of trails that crisscross the Anchorage Hillside when snow fell. Trail users began spotting her in the fall, posting about their sightings on social media and giving Betsy near-celebrity status. With a rotating crew of others, Koloski said he has spent "hours, days probably" searching for the cow. 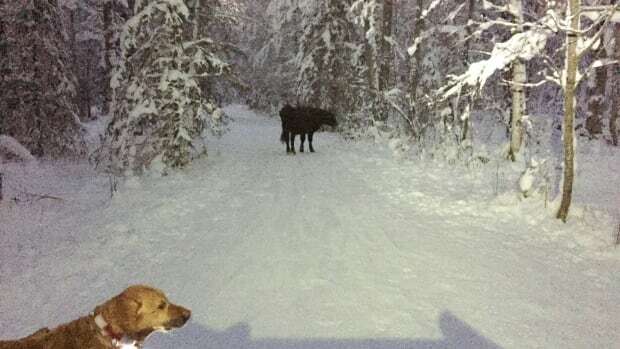 Anchorage police, animal control authorities and the Bureau of Land Management have relayed information about the cow's whereabouts, but she continues to elude him. "We're out days. It's nights. It's weekends," Koloski said. "If we get a nice night with a full moon, we go out as a group. "The forests just outside the city still have plenty of grass in tree wells where the snow hasn't touched, Koloski said. Betsy also has access to fresh water sources. "This cow comes from an area where she's been very self-sufficient," Koloski said. People have tried to lure the cow with food, but that's not a good idea, he said. "I know deep down this cow doesn't want to be caught," Koloski said.